Imagine attaching a metal screw into a ceiling then tying a cord onto a flashlight to the screw. Place your camera phone directly under the flashlight preferably at night, turn on the camera, turn on the flashlight then hit it. Watch as the random light arc swings wildly around until finding its stable immobile equilibrium. The camera will capture the continuous trail of gravity balance gyrations by tracing skinny lines. A person with a concussion has trouble holding their posture, they tend to sway, over-correcting while trying to find the vertical as if they are on a tilting floor. Inside the muscles that control our vertical posture, the exquisite middle ear labyrinth orientation apparatus are disturbed in its gravity vector sensing feed-back loop. Researchers have figured out how to analyze the disturbed over-swaying body motion following a concussion with a body balance tracing motion, similar looking to the continuous, dampened flashlight wild lightline movements. Balance problems are an early indication for dementia and Alzheimer’s disease, according to Dr Li Wang and fellow researchers from the University of Washington. In an published article entitled : Performance-Based Physical Function and Future Dementia in Older People Li Wang, MS; Eric B. Larson, MD, MPH; James D. Bowen, MD; Gerald van Belle, PhD. Arch Intern Med. 2006;166:1115-1120, the University of Washington researchers studied 2,288 over 65 year old people who at the onset of the study showed no signs of dementia. People were enrolled from 1994 to 1996 and followed up through October 2003. A 6 year period. After six years 319 individuals had developed dementia, 221 of them had Alzheimer’s disease. The study tested for physical functioning using a number of tests. It was found that people with good physical performance scores at the beginning of the investigation were three times less likely to develop dementia than those with poor scores. The authors warn, “….premature return to participate, presents an acuter risk of the potentially fatal second impact syndrome as well as elevated risk of repeat concussion and associated long term sequelae including mild cognitive impairment, earlier onset of Alzheimer disease, chronic traumatic encephalopathy and amyotrophic lateral sclerosis. ” The authors settled on studying swaying postural deregulation as a means to assess a sensitive enough test to, ” identify concussion-related neurophysiological abnormality.” Previous studies identified changes as people age, they are less able to maintain postural stability employing a very detailed mathematical analysis using the principles of fractal/chaotic interpretation measuring Center of Pressure (COP) on a balance platform. How old is the sense of balance in evolution? Do you recall a essay on the hagfish and early life with the importance of bone metabolism development with the early brain? Well, the hagfish only have only a single, vertical canal in their vestibular system, sensing one direction only, up and down in terms of orientation on the sea bed where the hagfish live. Generally all jawed vertebrates have a similar system consisting of two chambers, the saccule and utricle, each of which includes one or two small clusters of sensory hair cells. 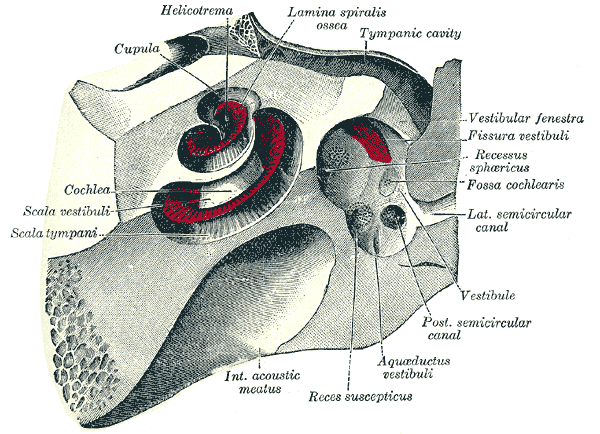 There are three semicircular canals arising from the utricle, each with an ampulla containing sensory cells at one end. 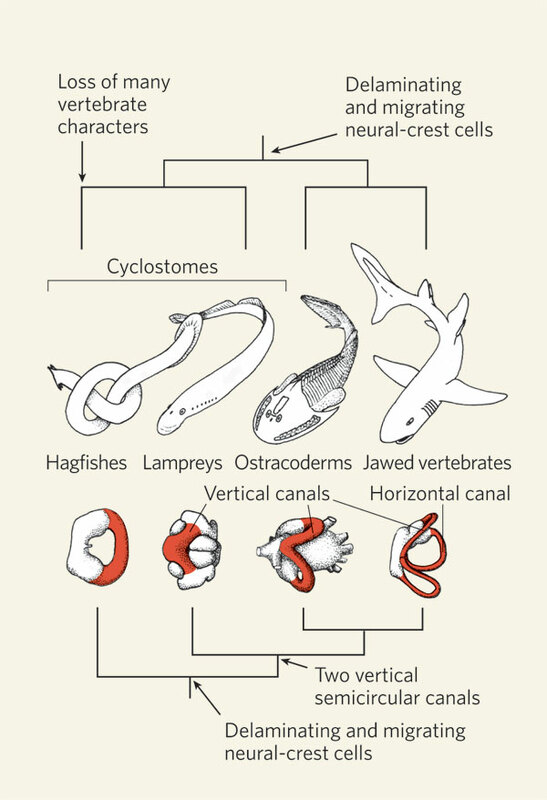 Janvier describes the embryonic shape changing of the hagfish, “…was the odd development of the ‘neural crest,’ a unique vertebrate structure that has possible precursors in other chordates. During the embryonic development of lampreys and gnathostomes, the brain and spinal cord form a dorsal infolding of the ectoderm (the future epidermis of the skin), which then closes into a ‘neural tube.’ Where the two lips (or crests) of this infolding meet to close to the neural tube, some cells of the ectoderm delaminate, becoming free, and then migrate to contribute to essential organs of the vertebrate body, such as the branchial apparatus, part of the brain case, and the dermal bones, scales, teeth, nerve ganglia and pigment cells. The neural crest thus generates a ‘new head,’ which possibly made vertebrates more competitive in the early stage of evolution.” The reason for all this interest in hagfish is still not established definitively, but defining its single labyrinth canal as the most primitive, the intense focus is the question: are hagfish the common ancestor to all vertebrates? That’s why this hagfish is very interesting. We are back to the basics of the oldest vertebrate communication between brain with bone and now a simple version of balance sensing. So as we jump back from the mists of early evolution, looking at a brain concussion may be the way into breaking open the understanding of how concussions change things in the brain; is to look at the oldest existing signalling systems, which in a nutshell is our logic for our concussion work. Lets get back to the Center of Pressure, (CAP) apparatus for trying to establish: has the brain healed sufficiently after a concussion? Ten varsity intercollegiate student athletes with mild concussion, basically mild traumatic brain injury (mTBI), or with recent diagnosis of concussion participated in the study. 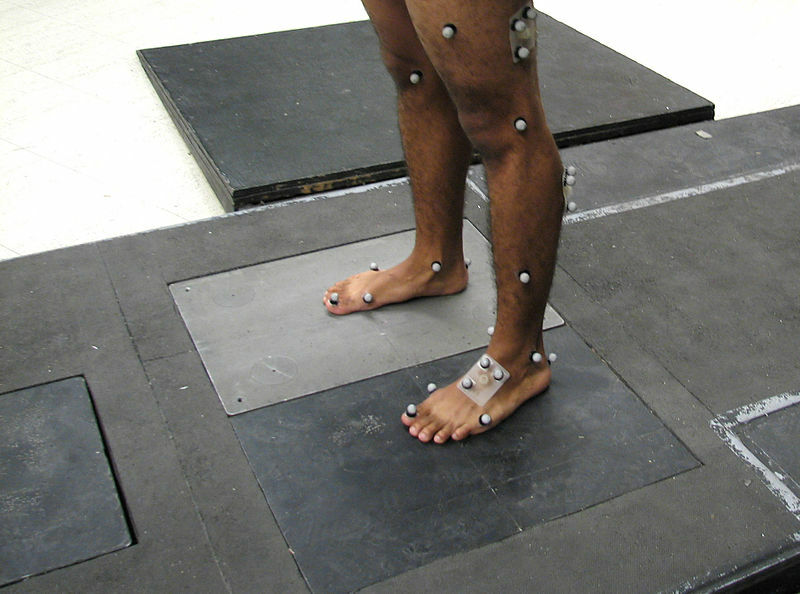 The volunteers stepped onto a force platform barefooted in the biomechanics laboratory for their testing session. Ground reaction forces measured medial/lateral, anterior/posterior and vertical and center of pressure data were collected from a single force platform. Lets get a better grasp of some of these important terms like, correlation dimension. The dimensionality treats the COP data as a time series which may provide as an estimate the, ‘number of (active) dynamical degrees of freedom involved in the postural control.’ Lyapunov exponents, ‘…quantify the convergence or divergence of nearby points in the postural state space. With the largest Lyapunov exponent characterizing a system’s local stability,’ which is, ‘the sensitivity of the postural control system to local perturbations.’ Next is sample entropy, which, ‘ …quantifies the regularity (or predictability) of a time series, while scaling factors like the Hurst exponent, which is determined by detrended fluctuation analysis (DFA) quantifies the extent to which a recorded COP time series exhibits long-range correlations.’ So lets get the authors conclusions in less scientific terms without getting bogged down with all the intricacies of the fractal mathematical interpretations. ” In stroke patients, maintaining balance is more difficult due to neuromuscular impairments, resulting in reduced postural stability. To cope with this reduced stability, postural control is actively (i.e., cognitively) increased, resulting in more regular yet higher dimensional COP trajectories. In the course of rehabilitation, postural stability improves, allowing the patients to relax their cognitive involvement in postural control, which leads to less regular COP trajectories. This process is reminiscent of that of automatization in skill acquisition. In line with this interpretation, the introduction of a cognitive dual task reduced the cognitive contribution to postural control, resulting in less regular COP trajectories of larger dimension but similar stability. Thus, by combining findings gathered from a complementary set of dynamics-related analyses under various task conditions and its recovery during rehabilitation after stroke, we could make readily interpretable inferences about (changes in) the underlying postural control. All in all, it is fair to conclude that the results of the present study supported our expectation that the use of dynamical measures would have surplus value in the analysis of COP trajectories. The implication of this overall conclusion is that, in future studies of postural control, it should be deemed worthwhile to incorporate both dynamical and conventional measures in the analysis of COP trajectories.”Now lets get back to the concussion COP trajectories. What concerned the concussion researchers was the essentially the use of their algorithm for,’… detrending, denoising, multiscale decomposition, and multfractal analysis. The measurement problems appear to be better than simple linear filters with wavelet and chaos-based approaches.’ The authors were basically looking at if a long-term trend could be accurately determined, in terms of understanding the mechanism for the trend signal itself. They conclude with, ….”nonstationarity associated with longer data will not pose a challenge in data analysis.” These authors used the are of COP to make their analysis. Their primary propose for evaluating the concussed athletes was to help, ‘assess recovery from minor traumatic brain injury (mTBI). Here are their pertinent conclusions. Covered a lot of material in this essay. Lets recapitulate. Postural sway if measured as a fractal time series of COP appears to get at a sensitive evaluation for post concussion healing time. Balance deregulation is an early signpost for Alzheimer disease occurrence. Balance is an ancient evolutionary characteristic from primal sensing found in Nature. Early life used brain formation in the embryo linking to coordinated bone metabolism to build a head for evolutionary advantage. Brain bone communication with balance sensing is conserved from the Mother species, the hagfish, through all vertebrates. Strange- that Sidney Crosby sped up his recovery from his concussions by being strapped in a astronaut chair loading his balance- organ brain, stimulating his vestibular system with Dr Ted Carrick, I don’t think it’s strange at all any more.